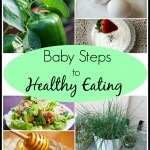 Welcome to the latest edition of the Baby Steps to Healthy Eating Series! 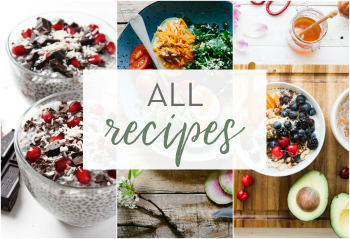 The purpose of this series is to encourage you to take the necessary steps, no matter how small, towards living a healthy lifestyle and eating healthy. This means not being afraid to try new things and cut back on foods that are bad for you. 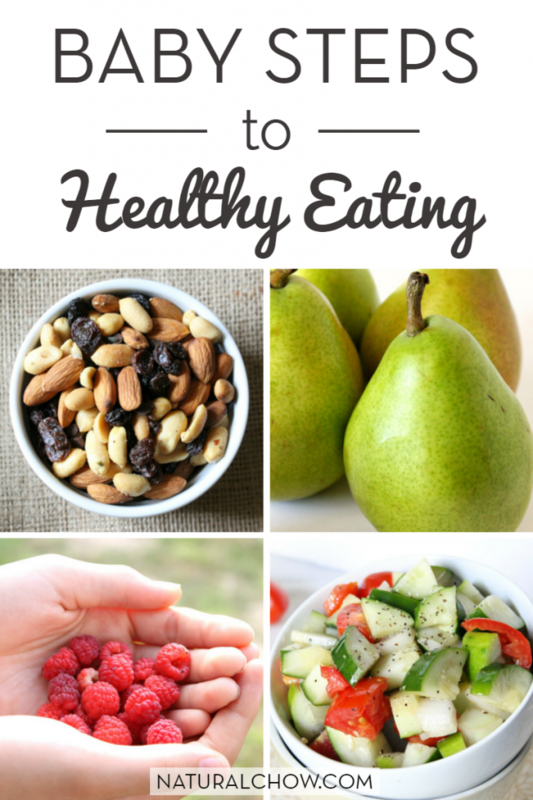 I remember when I started on my real food journey—things were rough! I didn’t have anyone to guide me and I made SO many mistakes. But that’s why I created this series. So that you wouldn’t have to go through all of the mistakes that made and so that you wouldn’t feel overwhelmed. 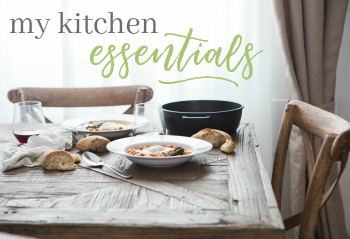 Each edition of this series includes three baby steps for you to take. A great way to take it slow would be to do at least 3 baby steps per month. For baby steps 1-3, click here. For baby steps 4-6, click here. For baby steps 7-9, click here. Make two loaves of bread this month. 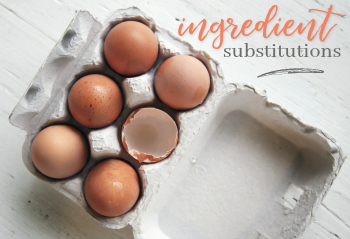 Making your own bread is easy and its way healthier than the chemical-laden bread from the store. Storebought bread is full of preservatives, dough conditioners, bleached flour, and plenty of other terrible things. Here is a recipe for homemade whole wheat bread (that actually tastes good). Pack a real food lunch for your kids for a week. By this I mean no processed foods, nothing with loads of sugar, and definitely nothing with food dye. Fresh fruits and vegetables, hard-boiled eggs, sandwiches made on homemade whole wheat bread, yogurt, etc. Here is a great resource for making real food lunches. Stop buying dinner rolls. This is an absolute, meaning this is a step to take forever. Dinner rolls can be purchased from the freezer aisle or the bread aisle, but 9 out of 10 times, there isn’t anything healthy about them. Instead, try making your own whole wheat dinner rolls. They’re inexpensive, easy to make, and REALLY soft and delicious. 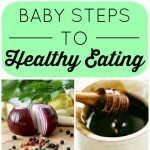 And that’s it for this edition of the Baby Steps to Healthy Eating series! Have you taken any of these baby steps? Please share below in the comments! 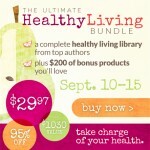 The 2014 Ultimate Healthy Living Bundle is HERE! Thank you for posting this- I’m really trying to clean up my act in terms of eating. I really like the idea for making bread but I’m super intimidated by the prospect of baking with yeast (I’m much better at cooking than baking!). Any tips about the yeast aspect of bread-making? This is a question I get a lot. Baking with yeast isn’t scary at all, and once you get the hang of things, you’ll be an expert in no time! Usually with yeast, you combine it with water, and maybe sugar and oil. I like to let this mixture sit for 5-15 minutes, or until it’s foamy and bubbly. Then add the dry ingredients, stir, knead, and let the dough REST. Yeast breads have to rise. But after rising, all you have to do is shape into loaves, place in the pans, and bake. I promise it’s a lot easier than it sounds and I’m sure you’ll get the hang of it in no time! I love these tips! I definitely agree that getting started on a healthy eating way of life requires making little baby steps! Thanks for sharing! 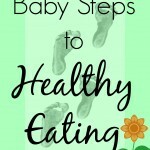 Taking baby steps is SO important when trying to sustain a healthy lifestyle. Especially with exercise. No one can go from a 100% sedentary lifestyle to running every day and then *keep it up. * Easing yourself into it is the way to go. Great tips! Found you on Motivation Monday. Thanks for sharing! Great tips! I make all of my own bread and LOVE it!! 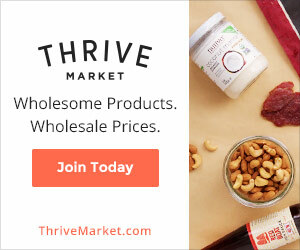 The recipe I use calls for honey instead of sugar which I love! I need to take baby steps, but am fascinated by how easy you make it. I already make bread so there’s one for me! Congrats, you’re featured this week at Inspire Us Thursday on Organized 31. 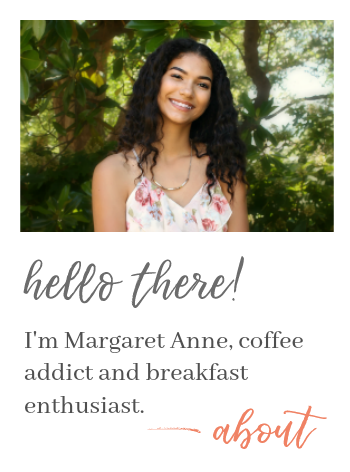 Thanks for the feature, Susan! I’m so glad you’re already making homemade bread because that’s an easy way to avoid a lot of additives, preservatives, etc. 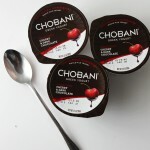 I love this since it makes it so easy to make a lifestyle change by tackling it in small pieces. 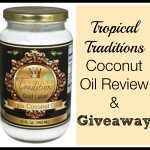 So glad you linked this post up at the This Is How We Roll Thursday link party.